We recently provided updates on the proposed Pied-a-terre tax that had the possibility of being passed in New York City. With the recent passing of the State budget, there has been changes to Real Estate Taxes in New York. Below is everything you need to know about the real estate tax changes as a result of the New York State budget. Overview: The Pied-a-terre tax was not implemented. Instead, there is a newly revised and implemented Progressive Mansion Tax and Progressive Transfer Tax. This will impact those in the $2-$5M purchase range the most. The new law applies to all closings that take place on or after July 1, 2019 except for those contracts that were entered into prior to April 1, 2019. This is specific to NYC contracts. The new tax now has 8 tiers that have a higher Mansion Tax rate as purchase price escalates. In addition to the Mansion Tax overhaul, effective April 1, 2019, the Transfer Tax also received an overhaul. For Residential purchases over $3 million, the NYS Transfer Tax increases from its current rate of 0.4% to a rate of 0.65%. Additionally, for Commercial transactions greater than $2 million, the NYS Transfer Tax will increase from its current rate of 0.4% to 0.65%. While no tax increases on property would be ideal, the above could be make less of a blow than the Pied-a-terre tax. The pied-a-terre tax would have positioned New York City as being not investor friendly and was also an annual charge -i.e. the property owner would have incurred this tax every year for owning the pied-a-terre. As a Buyer, it is important to understand that, while yes, costs of gone up on certain transactions, these taxes are a one-time, upfront cost. The owner does not incur the Mansion Tax and Transfer tax on an annual basis as would have been the case with the pied-a-terre tax. 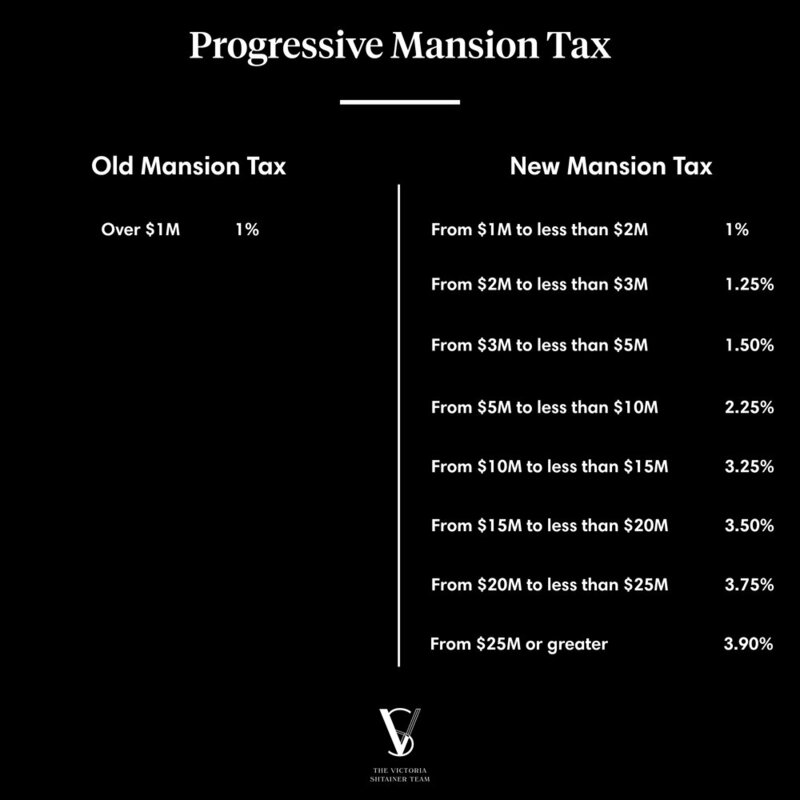 As was the case with the proposed pied-a-terre tax, the State has earmarked the additional revenue (expected to be $365 million) from the Progressive Mansion and Transfer Taxes to go to the failing MTA system in New York City. In a recent Podcast, Gary Vaynerchuck, known for his influential role in the media and advertising space as a leading entrepreneur, made strong remarks regarding homeownership that we would urge many to think carefully about. While there are certainly use cases that make sense for favoring renting a home, most individuals benefit greatly from homeownership. What were his remarks, and why should you reconsider? Vaynerchuck stated that he feels buying a home is not an effective use of capital. He went so far as to state that he would rent for the rest of his life and never buy a home again. Vaynerchuck’s Industry: Gary Vaynerchuck garnered most of his success as a tech entrepreneur. Starting companies, being an investor, etc. requires upfront capital needs that someone outside of this type of profession would not need. Thus, tying up a large portion of cash in the form of a down payment may not make sense for an investor that needs to remain more liquid. Additionally, one would reasonably expect that a tech entrepreneur would require one to be quite mobile in terms of traveling, so they would be less inclined to want to be tied down than the average person. Equity: When you purchase a home, you are building equity in the home. Your monthly mortgage payments are going towards ownership, an asset that will be yours. When you rent, you pay your monthly rent which goes in your Landlord’s pocket – you are not working towards owning anything. Over the long term, homeownership has been the most influential vehicle for driving wealth accumulation. We have seen that, over a long time horizon, home values tend to increase, thus increasing the owner’s wealth. Homeownership Is Not Dead: Most Americans still want to buy a home, and homeownership does make sense for a lot of people. However, the Millennial generation is struggling with homeownership because this generation is burdened with exorbitantly high student debt, coupled with high rents and costs of living in most job-hub city which makes saving for a down payment challenging for this group. As a result, Millennials are buying homes at a slower rate which leads some to believe that homeownership is dead. That is not to say that some of Gary V’s points are not valid when put into perspective. When thinking about liquidity, we would not recommend someone purchase a home that they cannot afford. If the down payment of a home will put you in a bad financial situation, you should likely reassess your budget to ensure you are buying a property that makes sense for you financially. Additionally, there are use cases for renting homes that also make sense for a lot of individuals. We can conduct rent vs. buy analysis that can help clients decide what makes the most sense for them. One of the biggest things to consider when thinking about renting vs. buying is time – are you planning to only be in this location for, say, 5 years? If so, taking on a 30-year mortgage to buy a home, etc. may not make sense and renting would be more suitable if you know you are going to be changing locations relatively soon. Have You Seen the Oculus in Downtown Manhattan? The anticipated Westfield Mall in downtown Manhattan has finally arrived in is open business. The mall, located at the Oculus at the World Trade Center site, arrives at a time when lower Manhattan is seeing a revitalization with many new stores, restaurants, and developments coming to the area. The mall was a project by real estate developer Westfield which invested $1.4 billion on the project. The space is certainly a modern interpretation on the classic shopping mall, a category that has been struggling in the retail space as they compete with online retailers. The Oculus, home to the subterranean mall, is a creation of architect Santiago Calatrava. Calatrava is largely known for his work designing railway stations and bridges, and later in his career, began to work on high-rise design with his Turning Torso in Sweden serving as an example. At heart, the Oculus serves as a transportation connecting New Jersey Path trains with lower Manhattan. The terminal is used by 300,000 commuters daily, providing a large amount of foot traffic past the retails that are calling Westfield home. More than 100 stores will arrive with 60 having opened during the grand opening on Tuesday, August, 16th. And, if you were thinking of stopping at the newly opened Sugarfina, creator of the rosé gummy bears, get in line, as there is a waitlist. They are proud to share that this is the only candy with a waitlist. At last check, Sugarfina stated the waitlist was 18,000 long! The new shopping and dining destination is located near the 9/11 memorial, museum, and 1 World Trade Center, home to the observation deck. Additionally, the location is moments from TriBeCa and the newly completed 30 Park Place, home to our new listing. For now, it looks like this is as close as you can get to the much talked about gummy bears. Our new rental exclusive, 30 Park Place unit 44E, consists of 3 Beds and 2.5 bath in the Robert A.M. Stern designed building. 30 Park Place is the first private residences by The Four Seasons in New York. By living in the building, residents get to take advantage of 5-star hotel-style living and all of the amenities that come with it such as in-room dining, car services, and a full concierge. View the full details of the listing here. If you are interested in living at 30 Park Place, contact Victoria. The Kent, a collection of two-to-five-bedroom condo residences, is coming to the Upper East Side. The project is headed by Extell Development and will be located at 200 East 95th Street. Extell is developing the building in collaboration with Beyer Blinder Belle Architects and interior designer Alexandra Champalimaud. The residences at The Kent will offer a sophisticated living experience that will blend seamlessly into the Upper East Side lifestyle. The residences offer a degree of customization, allowing owners to personalize their space. Customization options include flooring and kitchen finishes. Details throughout the homes include custom millwork and hardware, 10-to-15-foot ceilings in living and bedroom areas, and a choice of ebonized or brushed oak flooring. In the kitchens, owners can select from 3 finishes including ivory, opal, or onyx which serve as the backdrop for integrated Miele appliances, sub-zero wine storage, and Dornbracht fittings. Bathrooms are done in Alexis Azul marble and outfitted with Kohler BubbleMassage Air Baths. The building will also offer 3 signature penthouses. These homes will combine indoor and outdoor living with French doors integrating the large, private terraces with the indoor space. Other notable features include 12 foot windows in the great rooms, complete with a fireplace trimmed with a marble mantlepiece. The Kent embraces its Upper East Side location, offering an amenities package that compliments the lifestyle and the neighborhood. An inviting parlour is a great space to greet guests and socialize as it is outfitted with a fireplace and bar. If you are interested in previewing The Kent and current availability, please contact us for an appointment. It goes without saying that the New York hotel market is quite crowded with hundreds of hotels throughout the city. Luxury hotels have made their mark on the city by serving not only as hotel for guests, but trendy destinations for city goers alike by offering restaurants from renowned chefs and top-notch nightlife. The new wave of stylish hotels opening in New York is bringing not only big news in hospitality, but they are also being designed by big names in the architecture and design world such as Philippe Starck. SLS Park Avenue- The trendy hotel brand, SLS, by SBE will finally be coming to New York. The new hotel is slated to open this coming fall and is situated at Park Avenue at 30th Street. The property is designed by world famous architect Philippe Starck as his first New York hotel design since the Hudson Hotel in 2000. Not many details have emerged about the specifics of the restaurant and nightlife, however, SLS does say it will bringing vibrant new restaurant and nightlife concepts- that we can be sure of from the trendy hotel group! 11 Howard- This new spot in SoHo is now open and brings a fresh, minimalist design to the area. The hotels concept was designed by SPACE Copenhagen as they infused their minimalist Danish roots into the space. The property features custom finishes, bespoke furniture, as well as an inviting bar and library. The Beekman- Thompson hotels is bring some luxury to downtown with its new property at 123 Nassau Street. The hotel is situated in a downtown landmark building that is known for its nine-story atrium and pyramidal skylight. The design is being overseen by Martin Brudnizki who has designed SoHo Houses around the globe. In addition to the hotel, the The Beekman offers luxurious residences and culinary options be chef Tom Colicchio.